Liz Schwartz’s brother overdosed in their parents’ garage after sucking prescription opioids out of a used fentanyl patch. His mother found him on the floor and immediately called an ambulance. He made it to the hospital in time and survived. But within a year, Schwartz’s father overdosed the same way. He, too, survived. While Montana’s drug of choice for decades has been methamphetamine, the use of heroin and opioids like fentanyl and oxycodone is significant. The Montana State Crime Lab, which tests drugs found during arrests, reports it has seen a 475 percent increase in heroin since 2013. Overdose deaths were at their lowest in nearly 15 years in 2015. But, the Office of Epidemiology reported that 181 Montanans died of prescription opioid deaths between 2012 and 2015. In an effort to prevent more overdoses, state lawmakers are currently debating two bills that would allow for easier access to naloxone, a drug that reverses the effects of overdose. 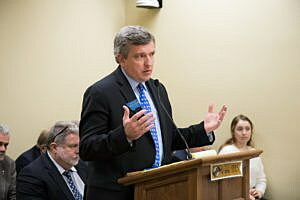 House Bill 333, introduced by Rep. Frank Garner, R-Kalispell, is also known as the Help Save Lives from Overdose Act. It allows for naloxone to be prescribed to organizations as well as individuals, meaning police departments and schools would be able to have it on hand in the event of an overdose. The bill also requires pharmacists to provide basic training for use of naloxone, and gives legal and civil immunity to people who administer the drug. House Bill 323, introduced by Rep. Gordon Pierson, D-Deer Lodge, allows schools to administer naloxone to students or non-students they believe are overdosing. Garner’s bill also allows for administration of the medication in a school setting. “This is proven to save lives, and will prove to save lives in the state as we see an increase in opioid use and abuse,” Garner said. Both bills have received broad support in both the House and Senate. HB 323 passed the House on a 95-3 vote, and passed the Senate last week unanimously. HB 333 passed the House unanimously, and is set to be read by the entire Senate. Overdose is just one part of the bigger addiction picture in Montana. Montana still has a problem with meth. Despite a dip in the mid-2000s, meth usage is once again on the rise, with more meth recovered by law enforcement in the first six months of 2016 than all of 2015. But prescription abuse is an entirely different problem. Oftentimes, addicts becoming addicted after first being prescribed opioids for legitimate pain needs. Liz Schwartz’s father was prescribed fentanyl after having back surgery to treat degenerative disc disease. Evan Cozad, a cook now living in Kalispell, became addicted to opioids after having multiple surgeries to treat Ehlers-Danlos syndrome, a disease that results in unstable joints. Cozad said he was consistently taking prescription opioids for two to three years before his doctor stopped prescribing them. By that point, Cozad was already in the throes of addiction, and began selling painkillers to support his own habit. Cozad called a friend when the effects became too powerful, and survived after being taken to the hospital. He eventually quit using opioids, and has been clean for five years. Other addicts are not as successful. The prescription drug registry has successfully made opioids like oxycodone more difficult and expensive to obtain. But the addiction remains, often making heroin the new, sometimes cheaper alternative. 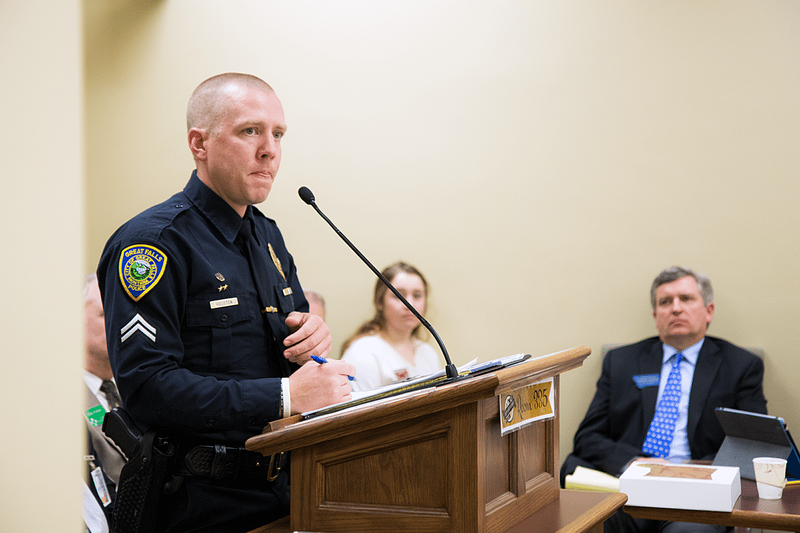 “We’ve already established a customer base, if you will, for heroin,” said Officer Clint Houston of the Great Falls Police Department. Houston said Great Falls has always struggled with prescription drug use. But now, heroin is being sold “hand-in-hand” with meth. Heroin is not as popular in rural areas, but 9th District Judge Robert Olson said he deals with oxycodone addicts, along with meth users and alcoholics, “virtually each and every day” in his Shelby drug court. “We see [prescription drug abuse] not only in criminal law, but in neglect cases, where parents have kids removed from their home,” Olson said. Cozad was able to recover from his addiction by using methadone clinics, which helped him wean off opioids. But Schwartz said her brother has only stayed off drugs because of being incarcerated. Heroin and opioid usage is notoriously difficult to treat. Malcolm Horn, director of special services at the Billings addiction treatment center Rimrock Foundation, said oftentimes addicts relapse due to the extreme physical discomfort of withdrawal. Horn said opiate and opioid addicts often experience “protracted withdrawal,” meaning they experience withdrawal symptoms longer than other addicts. This means it takes them longer to detox, even once the drugs have physically left their bodies. Horn said this often makes recovery even more difficult, as insurance doesn’t recognize those withdrawal symptoms because the user has technically detoxed. Addicts who have spent some time recovering are also at a much higher risk for overdose due to their decreased tolerance. Horn said many overdoses occur when an addict rediscovers a stash of drugs and relapses, assuming they can handle a dose they would have taken before treatment. Finding solutions to the opiate and opioid crisis, as well as Montana’s drug problem at large, has proven extremely difficult. The state has been battling its meth crisis since the early 2000s, and has seen little in the way of progress. Garner said his bill is a different approach to curbing the problem. As a former police officer he was part of a drug task force in Kalispell. Garner said the criminal justice system does not solve all the problems. “There are elements of the criminal justice system that are effective, but for some people all of the consequences, all of the interventions, don’t work until they get to a certain point,” Garner said. Garner said his bill gives addicts who overdose another opportunity to see how far their addiction has progressed. Pierson said educating the public on the dangers of prescription and heroin abuse is a big part of the battle. He said families need to be aware of the need to keep their prescriptions locked up, and of the “horrible effects” of addiction. Schwartz also said there needs to be greater education not just on the effects of addiction, but on what addiction actually is. And, both she and Cozad say Montana needs expanded treatment options for addicts.